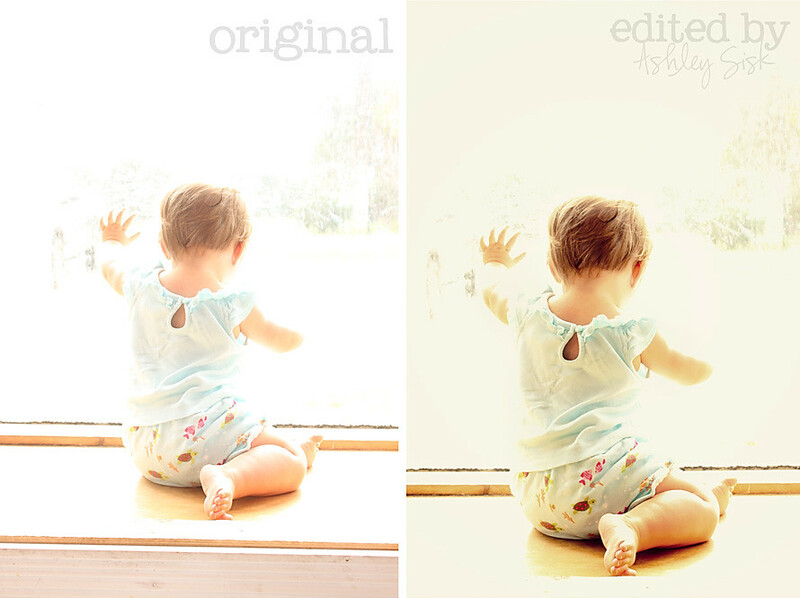 Liz from “tickled PINK” contacted me the other week with an editing challenge. She sent me the shot on the left and asked if there was anything I could do with it. I took one look at it, and couldn’t wait to work with it…I seriously love the backlighting of this shot. For a photo like this, it doesn’t have to take you hours to correct the over exposure – it might have taken me 5 minutes. I started in Adobe Camera Raw, made a few adjustments and then brought it over to Photoshop Elements. I worked through Amy McMaster’s Squeaky Clean (basic levels adjustment) and then applied Nelly Nero’s Woodstock action and Amy McMaster’s Berries N’ Cream action. Once I’d merged those layers, I created a new layer and used my burn tool to darken her skin just a hint. What do you think ?